What happens when a niche PR agency is given nine months to pull off the international food story of the year ? Here’s our story…. The Food on The Edge symposium took the food world by storm last October. An inspiring collection of chefs exchanging ideas on the future of food, how we dine and what we dine on. It was a platform for sharing ideas and planting the seeds of new ones; a magic mix of location, people and inspiration. Looking back now it is amazing to see what we achieved in nine short (but very busy) months. A mere germ of an idea shared with us in November 2014 by JP McMahon, a Food PR client since 2010, owner of Michelin-Star Aniar Restaurant, award-winning Cava Bodega and Eat Gastropub. JP wanted us to help bring about an event where the biggest names in the world of gastronomy would come to Galway, share ideas, their vision and have fun – how could we possibly refuse? The logistics of bringing 40 speakers to Galway for an unforgettable five days was never going to be cheap. Looking for sponsorship and funding at this magnitude was something that was not an everyday activity for us but rise the challenge we did. We prepared proposals, attended meetings, negotiated, redrafted proposals, tweaked proposals, made presentations and assisted in the necessary paperwork . Using contacts from previous projects, our next step was to secure some solid business backing. We compiled a wish list of potential sponsors and understandably Fine Dining Lovers was top of our list. We instinctively understood the significance of such a collaboration and worked tirelessly to secure this partnership. Stafford Lynch, a previous client of Food PR, distributor for the prolific brand San Pellegrino and their brand Fine Dining lovers was a perfect fit which would aid us to propel the event onto an international platform. Food On The Edge embodies all the values of Fine Dining Lovers : a bespoke, intimate, quality and inspiring event. Along with the Fine Dining Lovers Milan-based digital team, we agreed exclusivity on an editorial calendar with talks broadcast on their site after the event. In a single newsletter, the story of Food On The Edge was exposed to over five million people. We were the leading story on their homepage 1.43K times throughout the period June to November 2015; a website with 238K visitors each month. Our quest for sponsorship continued – did everyone we approach come on board? Of course not, it was January we there were only nine months before the event and we had not yet we cranked up the publicity engine. In quick succession Fáilte Ireland and Bord Bia joined up with incredible support – right down to details like branded bags, jackets and lanyards. They gave invaluable assistance with promotions and logistics. The Food PR team worked with Fáilte Ireland on leveraging their international media contacts and maximising media opportunities during the event. We contacted our friends and colleagues in The Sunday Business Post who joined us as media partner. Together we created a proposal for covering the event with exclusives and advertising. With these key partners and sponsors in place, the actual PR work could start – now eight months and counting. In a whirlwind of photo shoots, pitching, re-pitching, coordinating, sourcing images, recipes, quotes and arranging interviews across time zones with busy chefs, we barely drew breath. Our to-do list included two press launches, media invites, press articles, online articles and a host of other high-value, short-lead time international publicity. Taste.ie signed up as our Irish web partner with an agreed proposal of coverage. International travel and food publication Four Magazine committed to a series of content. Staying organised, reacting to emerging news and new content, keeping the story fresh and developing creative angles made our internal production meetings fun and dynamic. As with all PR plans, ours was an evolving, ever changing process which kept us on our toes and the creative juices flowing. Check out our Coverage Book for an overview of the publicity we secured. Social media played a major part in promoting the event, maximising ticket sales but with an eye to next year we also wanted the message to reach top-tier chefs who would participate in FOTE 2016. A series of blogs with new speaker announcements pushed the social media strategy and naturally we tweeted our hearts out till we trended and trended. 16.5 million impressions across 3.7k posts. The response to the wonderful experience we created led to 100% positive coverage on social media.Over 100 publications were pitched with a success rate of 89% on pick up – and many of these were international publications. October saw us coordinating visiting media, arranging press passes, media plans and photography briefs plus welcome dinners, closing events and the bits in between. In true Food PR style, we never missed an opportunity to add value . We met chefs as they flew in, arranged registrations, introductions, greeted local dignitaries. We briefed guests of honour for their speeches, drafted invite lists, chased RSVPs, managed the closing party. We even supplied speakers (thanks Ruth Hegarty) with pints of Guinness in the rain from O’Connell’s (thanks guys!). 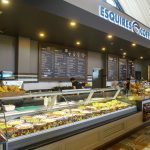 Never ones to miss an opportunity for our clients: Esquires Coffee kick started their social media campaign by offering attendees free coffee, Maria Lucia Bakes made sure the speakers were energised at breakfast in The House Hotel with her granola.